The three biggest words in battery structures are “Area, Area, Area.” The more anode and cathode area a battery can expose to the electrolyte that carries ions and electrons between the positive and negative ends of the battery, the better. Most battery configurations, according to researchers at Carnegie Mellon University and Missouri University of Science and Technology, block a great deal of interaction between these elements. 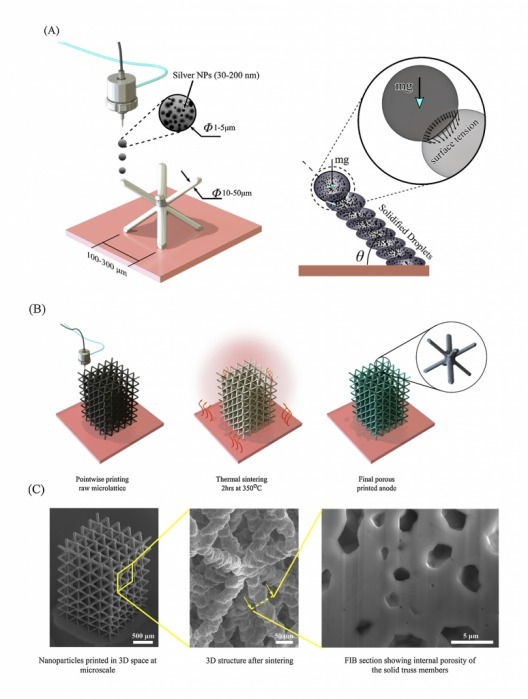 Their solution is to go porous in a microlattice battery, thanks to 3D printing. Electrodes present some surface area to the electrolyte, which can only interact with the surface area presented. 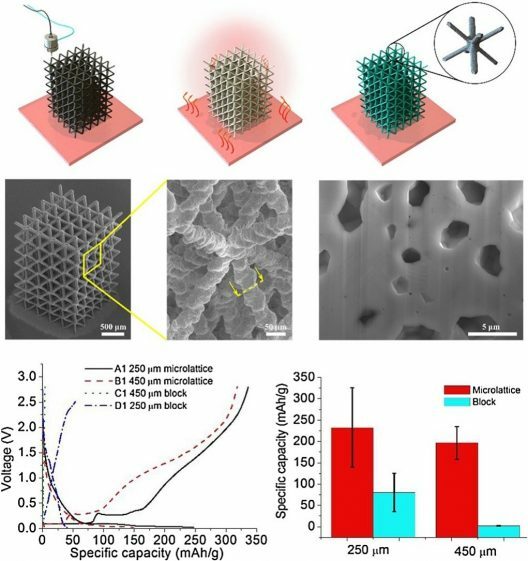 Rahul Panat at Carnegie Mellon and Jonghyun Park at Missouri S & T have created a cube-shaped battery composed of microlattice electrodes which present significantly greater amounts of surface area to the electrolyte. 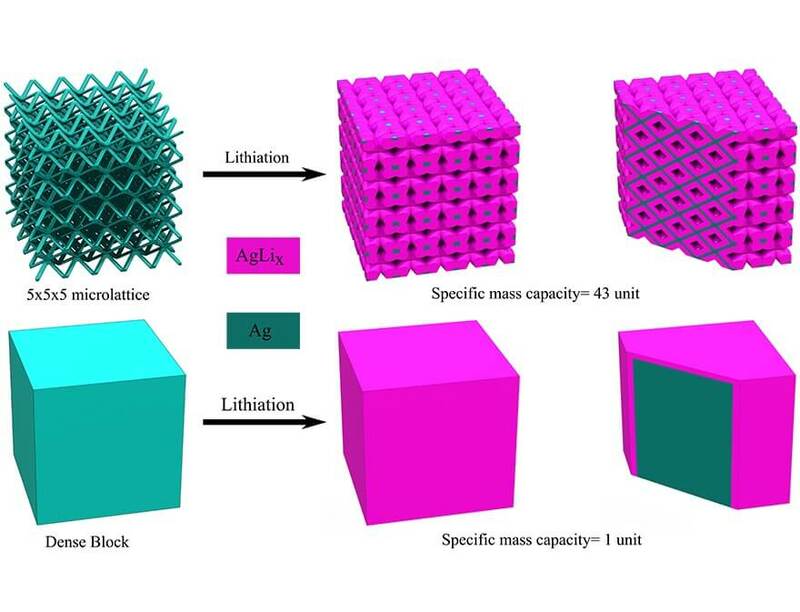 The microlattice structure proved to be mechanically robust, not losing its minuscule shape after 40 charge-discharge cycles, and managed to retain its electrical capacities. The authors note that the technology can be applied to a wide range of electrochemical energy storage systems. As noted by the researchers, batteries can be lighter for the same capacity as current storage devices – or more powerful for the same weight. The microlattice’s strength, electrical performance, and potential design flexibility could lead to uses in medical devices, drones and even full-size aircraft. “For example, a part of a drone can act as a wing, a structural material, while simultaneously acting as a functional material such as a battery.” This would bring one of your editor’s dreams closer to reality – the Grand Unified Airplane, in which the structure stores energy while collecting it from the act of flight itself. Sunlight, even the wind itself, could power the aircraft. With materials like the microlattice battery, this dream could be realized in at least some components of future aircraft.